In a couple of months, we are going to Vancouver, BC (our neighbour to the west) for about a week and then I'm heading down to Seattle, WA to visit my sister there. Seattle = Shop to you drop everyday. And I mean from first thing in the morning to when they close kind of shopping. I'll probably lose weight from all the shopping I plan on doing! Anyways,I have to start saving up because there are few big ticket items that I do plan on picking up when I'm down there. BUT...there are tons of temptations down there. Cheaper clothes, cheaper shoes, cheaper cosmetics, cheaper everything. Plus, being from Alberta, I'm tax exempt in most stores (BONUS!). We all know how weak willed I am when it comes to seeing something that catches my eye. And I've learned my lesson - last time I was down visiting my sister, I saw this beautiful Michael Kors clutch at the outlet for like $20 and I didn't grab it, so by the time that I had decided that I wanted it, it was back to regular price again ($120!!!). So sad. To this day, I remember that lesson - hesitate and you'll die. Okay, maybe not. :P Anyways, back to the story, I'm going to try and not buy anything for the next three months...BUT...I am allowed 3 "free passes" to buy anything I want within reason (within reason, as per my husband means that I cannot run out and purchase the four-digit Louis Vuitton that I've been dying to have). And of course, if there are items that I run out of, I can purchase only ONE of them. It almost seems like he's really put some thought into the rules and regulations....Anyways, he had to go out of town for business and he felt really bad (I know that this will sound really cheesy, but my husband and I are inseparable), so he said that I could go shopping, without having to use a free pass (he didn't really think that one through did he???). P.S. This is going to be a long and picture heavy blog. I'm also trying a new spot for taking pictures, new camera set up and photo editing "software", so hopefully, everything turns out okay! Edit: yipes, upon previewing, I see that most of my captions and some shots are super blurry...I apologize ahead of time, this photo editing software is still a little new to me. I had previously picked up a dotting tool from Sally's but they only had one size, so i ordered a 5 pack of dotting tools and a couple of mini polish sets (i couldn't resist!) from NailpolishCanada. 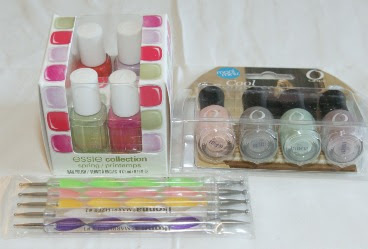 The mini polish sets that I picked up were Essie's "Navigate Her" and Orly's "Cool Romance". I'm not the biggest Essie fan because I find their polish a little on the thin side and not very opaque, but these colours were so gorgeous that I couldn't resist and thought that I'd try and give them another go. I really like Orly so if this set is anything like the I Love Nails mini set, I'm going to upgrade their status from "like" to LOVE! From L to R: Ole Caliente, Tour de Finance, To Buy or Not To Buy, Navigate Her, You're Blushing, Jealous Much?, Prelude to a Kiss, Faint of Heart. Essie: Ole Caliente is a hot red, Tour de Finance is a shimmery magenta, To Buy or Not To Buy is a light mauve and Navigate her is a light moss green. Orly: You're Blushing is muted lavender, Jealous Much? is a minty green, Prelude to a Kiss is a bridal pink and Faint of Heart is a light concrete grey. 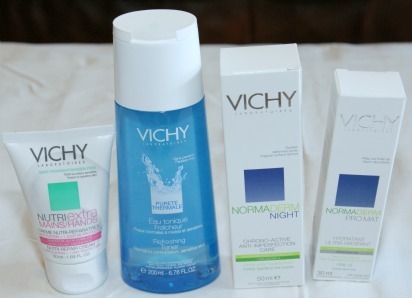 London Drugs was having a sale on their Vichy products and I'm a huge fan of Vichy. From their Normaderm line, I picked up Pro Mat (Ultra Mattifying Moisturizer) and Night (Chrono-active anti imperfection care). My skin has finally calmed down and now it's time to fix the damage that has been done. I also love toners, so I picked up a toner. If you spend over a certain amount, you received a free hand cream. Oh Sephora....I can't live with you and I can't live without you. I had just finished purchasing a bunch of items with the VIB 15% off and then I receive a 10% for "renewing" my VIB status. As far as I'm concerned, it should've been like 50% because I think that within a year, I renew that sucker many times over! 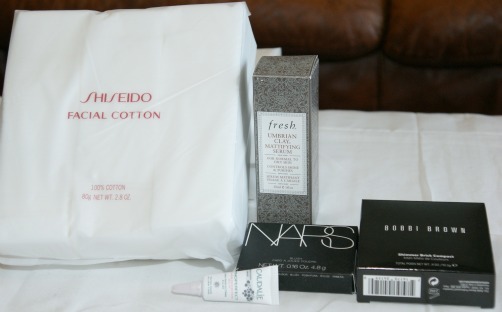 I just picked up more Shiseido facial cottons, Fresh Umbrian Clay Mattifying Serum, Bobbi Brown Shimmer brick and a NARS blush. For those that use the Shiseido cottons, Sephora is cheaper than the Shiseido counter at The Bay. I know that these cottons seem like an unnecessary splurge and that's what I had thought too until I tried my first one. I'm never going to look back. They are softer and are such good quality that it seems to use up less product also. My mother suggested that I pick up the Bobbi Brown Shimmer Brick. It's a little too shimmery for me, but it's got some really pretty colours, so if anything, I can use it on top of another blush to add a little something-something to it. For the most part, they are all really light sheer colours in the palette. I also received a sample of Caudlie's VinoPerfect Day Perfecting Fluid. Actually, the main purpose of going shopping was to pick up a new blush. I've been using MAC's Peachykeen since my University Days (not to date myself, but let's ball park it at "a couple of years of ago...plus a few more years) and I just find that it's not really making me look peachy or keen anymore. I've been really wanting to try out the "doll" look with a really fresh, pinky cheek. 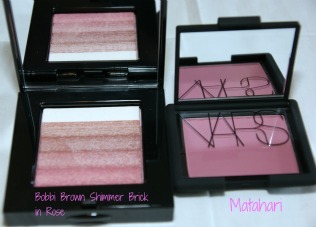 And of course, MAC had just released a few collections, so I stopped by a store with two blushes in mind that I wanted to purchase from their Tres Cheek line. Alas, they only had one of the two blushes and of course, I walked out with more than I intended. 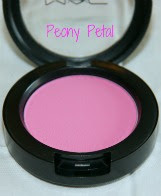 Peony Petal is very similar to NARS Matahari, but a little brighter in shade but equally as gorgeous! I cannot wait to wear this! I picked up two more brushes. Gosh, I don't know why. 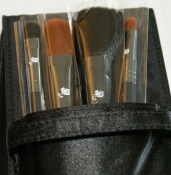 I have so many brushes already (I guess I'll just add make up brushes to my hoard list). 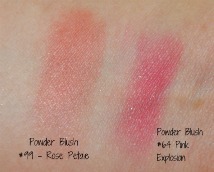 The shadows are very buildable and same with the blush, though the blush reminds me very much of my Peachykeen. My favourite eye shadow colour has got to be Drama. It's iridescent and just simply divine. Latte is a pretty colour also. Nice for highlighting. 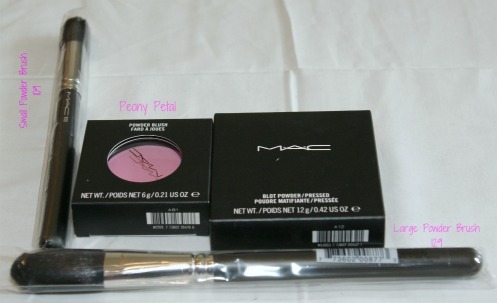 Last but not least...my splurge items. Actually, these were a very generous gift from my mom. 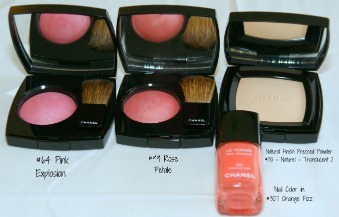 I picked up two blushes, pressed powder, polish remover (my mother insisted!) and a nail colour. 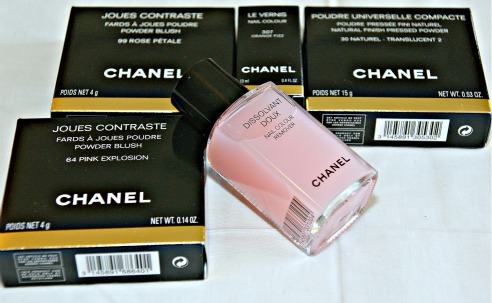 I love Chanel nail colour. I know that they aren't 3 free like most new polishes are out on the market, but I still love them. I own quite a few shades and will only purchase them if it's a shade that I really LOVE (because they really are a splurge). Another apology for the blurry pic of the nail polish, but it does capture the shade. The blushes are not baked. Rose Petale looks really orange, but it's great on my skin tone. It's natural and even contours a little (no, I don't have orange skin! ), but the pink explosion really is a pink explosion. It's actually quite sheer and buildable. This is probably about 5 applications. They both have a tiny little bit of shimmer to them, just barely noticeable. The nail colour is this bright peachy orange. It's so opaque that I probably could get away with one coat. I also received a bunch of samples. The Chanel rep also let me look at her Summer Lookbook for the new products that will start hitting the counters in a couple of weeks. Lots of shimmer bricks in golden hues, new perfumes, new skincare and a new mascara. To me, this mascara will be a huge deal. It's the same formulation of Blinc but with the benefits of Fairy Drops (I find that Fairy Drops is way flaky and Blinc doesn't build of lengthen). She did say that she would call me when that stuff comes in so I can get first pick (or at least twentieth). Fingers crossed that she remembers because I would hate not being one of the first people in the city to get my grubby little hands on the mascara! Whew! That's it! I promise to do better with the editing next time! Out of all of the items that I purchased, the one item that I consider a real splurge would be the nail polish (it clocks in at $28! Thank god for moms!). What is or would be your splurge item? "To this day, I remember that lesson - hesitate and you'll die." LOL great motto to live by, spoken like a true beauty blogger! this is a MASSIVE haul, woman! holy cow! packing it all away in your makeup area/bathroom etc must've been so fun and exciting! I was just talking to another blogger about photography and how I am not a good photographer but I hope it doesn't take away from the enjoyability of my blog. I DO try, I swear, but I just think I'm too impatient to get 'perfect' shots, plus my camera isn't that great and I don't own any nice photo editing software. Jayne (Costmetic proof) makes me green with envy with her photography! And you magically have pretty borders on your photos, you girls put me to shame! Oh, do not EVEN start with me about Jayne! I love her pictures! I'm trying...but like you, I don't have the patience...and I actually kind of dread the amount of editing I have to do to just to get to what you see! PS. Your pictures are great! I was sad to put everything away! I might forget where I put everything! HAHAHA! Omigoodness you guys! Don't hate me!! I feel so honored that you like my pictures! I use just a 10 megapixel Fuji and I only know of two functions on it: "MACRO" and "SUPPRESS FLASH". I wait for some sunshine and then I use Microsoft Paint to crop. I hate editing and changing saturation because I don't want to spend 20 minutes editing one photo...I wish I had pretty editing software too, but I still think I wouldn't use it for how expensive it is. I've been using Windows Live Writer for the watermarking and pretty borders. Maybe try it out? It's free and pretty easy to use. What I love most about your blog and Steph's blog is your attitude in your writing. I find it so enjoyable and relaxing to read, with legible font so photography is not a huge thing for me. And ummm, WOW! What a haul!!! Holy crap, I was so excited for you that I couldn't even read the words! I just kept wanting to see what else you picked up! Awwww! I'm really glad you like reading my blog - I love yours too!!!! I might have to check out Windows Live Writer.... :) Thanks for the suggestion. What an AMAZING haul! I am definitely bubbling over with jealousy! LOVE EVERYTHING OF YOUR HAUL! You did great my dear! I am now following your blog sweets! Hee hee! I'm not going to complain about my husband's temporary lapse in judgement! LOL!